Natural medical grade crystals that are electrically micron-sized to round shape to break away dead cells but not scratch skin. Rubies and sapphires are made out of these same crystals, but owe their characteristic colors to trace impurities (iron,chromium..)That is the reason why these crystals exhibit diamond level hardness and strength. Mix ratio is 1 spoon of crystals to 2 spoons of oil/cream to create a paste like mixture. Customize mixture to your skin type. Hypoallergenic & Made in USA. Cleanse the body area to be abraded or take a shower. Get a plastic bowl and mix a teaspoon of crystals with a cream, gel or oil of your choice. If you are making a face cream for a dry/normal skin you can add shea butter, olive oil, almond oil, jojoba oil or rich moisturizing cream. If your skin is oily and acne prone consider pure alcohol-free aloe vera gel or cucumber gel. Massage this micro-crystal cream with your hands on damp skin. Don't linger in one place keep circulating. Rinse well and apply moisturizing lotion. 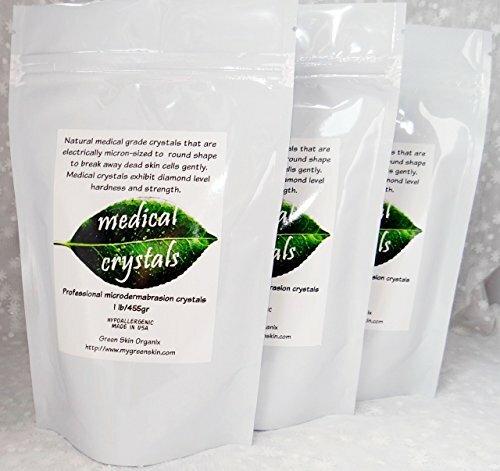 If you have any questions about this product by Medical Crystals, contact us by completing and submitting the form below. If you are looking for a specif part number, please include it with your message.